METEOR MITE! Years in the making! A tale of Galactic Proportions! 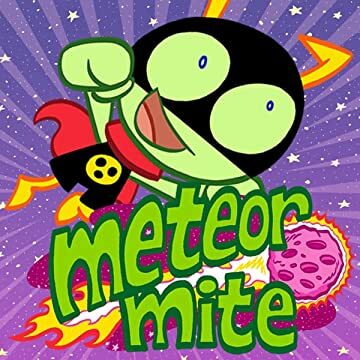 Finally Meteor Mite comes to Earth! The first 8 pages were originally presented in Dark Horse MYspace Presents. And now...finally the series continues with this full issue adventure! The evil Alien Meteor Mongers invade earth! They will not stop until they find the Enchanted Crystal! WHAT? Can this Crystal be the ultimate power in the universe? I think so! Meanwhile in the local park on earth, Mikey Mite and his girlfriend Dottie, get attacked by falling meteorites...and aliens! What happens if Mikey finds the Crystal first? 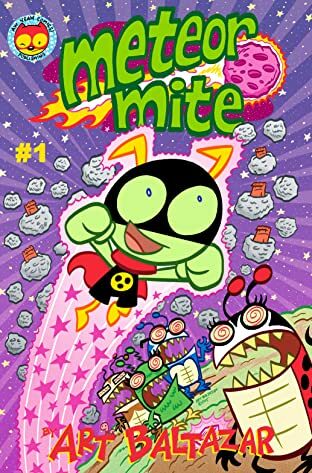 You guessed it, the powerful superhero, METEOR MITE, must save the day! But how does one learn to be a superhero? How does he keep his friends Bob and Dottie safe?! What is the Enchanted Crystal? Where do those powers come from? What's the Meteor Mongers secret? Mikey is about to step into a whole new world! The adventures of Meteor Mite and his pals continue in this epic adventure! From the mind of the Eisner Award winning creator ART BALTAZAR! Superhero Sci-Fi epic-ness at its best! AW YEAH!